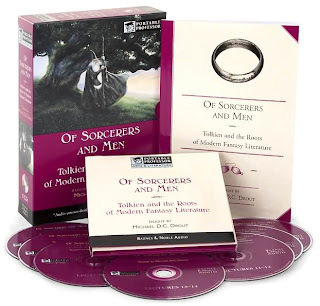 Recently while I've been working I've been listening and re-listening to a series of lectures on modern fantasy literature taught by Professor Michael Drout. His analysis of the Hobbit is superb. I've listened to it and his lectures on the Silmarillion several times already. Some of the later lectures Professor Drout teaches are about the "worthy inheritors" of Tolkien. And what's interesting to me is the concept of this "Tolkien anxiety" -- that everyone else who comes after must deal in some way with Tolkien, whether as a reaction against him or following in his giant foot steps, or trying to develop something original outside of Tolkien's massive shadow. 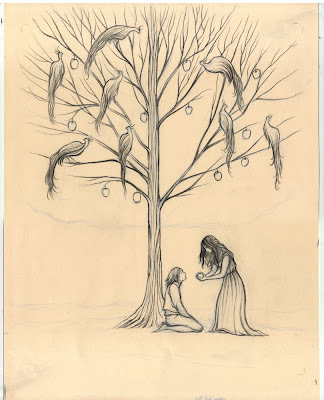 Well, for me I have "Arthur Rackham anxiety." There is the potential to feel like most every thing I want to do Rackham has already done, and better. While I don't think any of my work falls in step too closely with Rackham, I just love his work. He has left a large shadow over fairy tales and fantasy paintings with which we all must deal if we are to step into the fantasy or fairy tale genre. I wish we could all see what he might have done with The Hobbit, or The Lord of the Rings, or The Silmarillion. 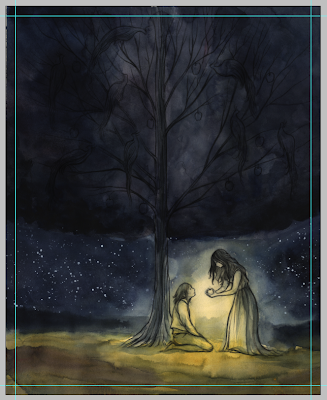 Can you imagine an Arthur Rackham painting of Lúthien causing the Dark Lord to sleep and Beren cutting the Silmaril from Morgoth's iron crown? Beren fighting (and losing a hand to) the Wolf, Carcharoth? 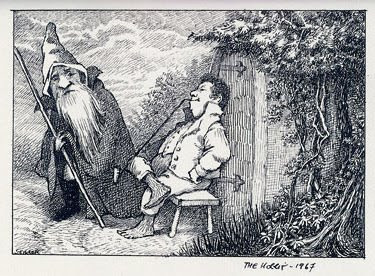 Here's another tangent for you -- Have you ever heard of the never finished Maurice Sendak illustrated Hobbit? That was news to me. Unfortunately Mr. Sendak suffered a heart attack after completing just a few drawings and the project fell through. That is something I could really get into. Justin has his terrific paintings of The Hobbit. (Be sure and click through to see all 5 or 6 finished pieces) And while I'd hate to be thought of as trying to catch a ride on the coattails of someone's success, I'd love to do some Hobbit paintings of my own before Del Toro and Jackson make their mark. See with what perfection we must all deal? He makes all other attempts look paltry and contrived. Yet we must try. 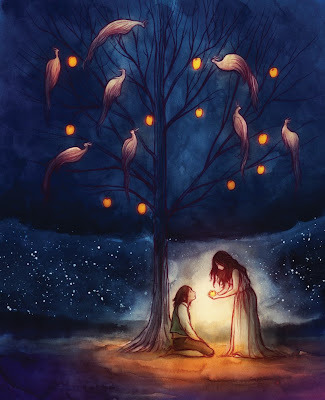 A king had a tree which gave golden apples. Every night a thief stole apples and so the king's three sons sat up to catch the thief. The older two sons fell asleep but the youngest son, to his (I'm sure) immense surprise, saw that the culprits were nine peahens. And in a turn which possibly might have been more surprising than that, one turned into a beautiful girl. 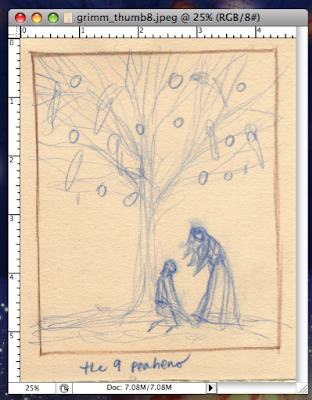 That is the moment I chose to illustrate (and with that choice throw myself on the mercy of Arthur Rackham.) The rest of the story is terribly fascinating. You can read about it here. Once again, if it's been unclear, heretofor, none of the work I've posted yet is a finished, final piece. There are final drawings and final under-painting but these are all just steps in the process. In production news, I've completed the final watercolor under-paintings and have begun final work. Mark your calendars, April 3rd, 2009. Be there! I'll be posting a poster with all the important information as the show date draws nearer but even so, I hope you'll be able to make it! Next post : Beauty and the Beast, or how Walt Disney got it right way back in 1991. Great work man!However, your blog page is VERY slow on the scroll. Brade -- Thanks man, I appreciate. Yeah dude, April 3rd, "Grimm and Other Folks Tales" -- I was invited to do a show over at BJU, lower level. As the date gets closer I'll post a poster with all the info. I hope you can come! Stathis -- Yeah, I think probably some of the slowness is due to the amount of posts I have and I've got videos loading throughout and on the side bar. Nice work Cory... 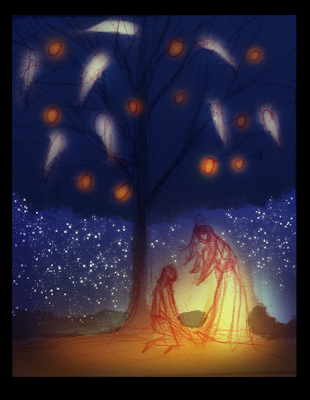 I have been working on my own Grimm illos as a portfolio exercise (I promise I am not poaching ideas). It seemed the best way to get out of a rut and try some new stuff. Anyway, I am consistently amazed at the emotion that your work is able to communicate--emotion and, yes, a little mischief. I cannot wait to see updates. Good post. That's the first I've heard of Rackham, and yea, he's really good. but yours is also looking very nice--definitely a more mysterious vibe.